Mahmoud al-Mabhouh as seen on a poster on a wall in the Gaza Strip town of Jabalia. Dubai, United Arab Emirates (CNN) -- Mourners buried a senior Hamas militant Friday after his recent death in Dubai -- a death Hamas calls an "assassination." Mahmoud al-Mabhouh died in Dubai on January 20, said Izzat al Rishq, a Hamas member based in Syria. Al-Mabhouh was a founding member of the military wing of Hamas, which blamed Israel for his death. "We hold the enemy responsible for the assassination of Mahmoud Mabhouh," the militant wing said in an online statement. "The enemy will not escape punishment." The Israeli Foreign Ministry said Sasportas was kidnapped on Feb. 16, 1989 and shot to death. His body was found in May 1989. The ministry said the same Hamas terror cell that kidnapped Sasportas abducted Saadon on May 3, 1989. Saadon's body was discovered in 1996. Government officials in Israel declined to comment on the militant wing's statement. One official in Dubai told CNN that al-Mabhouh died of natural causes. But the Emirates News Agency said authorities determined that the man was killed and were working with Interpol to hunt down alleged perpetrators thought to be part of a "criminal gang," some of whom have European passports. Hamas said it is investigating the death and that it would publish details "in a timely manner." Al-Mabhouh's brother, Fayek al-Mabhouh, said that preliminary results of Hamas' investigation show he was killed by electrocution and strangulation with a piece of cloth. Fayek said his brother had survived other assassination attempts. The Emirates News Agency report quoted a security source saying the gang had been tracking the victim. Al-Mabhouh had lived in Syria for about 20 years. He traveled from Syria to Dubai on January 19 and died the next day, Hamas officials in Gaza said. It's not clear why he traveled to Dubai, but Fayek al-Mabhouh said his brother arrived at a Dubai hotel in charge of the Hamas mission. 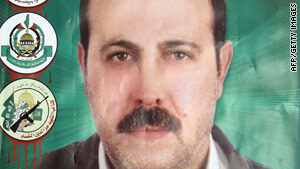 His body was returned to Damascus on Thursday night and was buried after Friday prayers, Hamas officials in Gaza said.